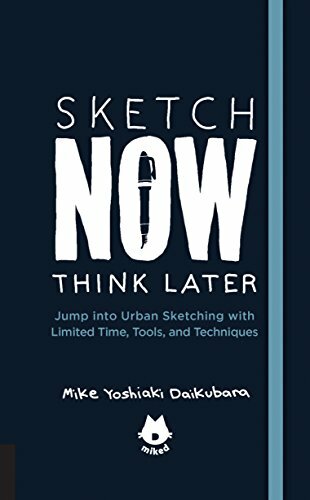 Mike Daikubara's Sketch Now, Think Later is published in the same format as the Urban Sketching Handbook series. It's a compact handbook with an elastic band to hold the covers together. Inside, it features the urban sketching tips from Mike Daikubara who has been sketching since 2000. This book collects many useful tips that beginner sketchers should find useful. They are written in bite-sized chunks that make for easy reading. I've a lot of sketching related books and the tips and techniques featured here aren't new, but it's always interesting to read about other artists' perspective, see how they use them, and think about them. There are also many wonderful pen, ink and watercolour sketches that fills the book. This book is an enjoyable read. I like the immediacy of sketching as an art form, and it's cool to see Mike's work and the world through his eyes. I've bought several other sketchbooks by him over the years.